Norland Bridgeford Log Cabin: The Norland Bridgeford Log Cabin is built featuring a large roof extension to the front which is an ideal, sheltered area to set out the garden furniture or to simply relax and enjoy the garden. With its large double doors featuring full length glass, the fixed full length windows to either side of the double doors and a tall opening window (that can be fitted in either the left or the right side during assembly) this lovely log cabin is light and airy but being double glazed is an ideal 12 months of the year log cabin suitable for almost any purpose. The styling is simple yet modern and attractive whilst the purpose is practical. 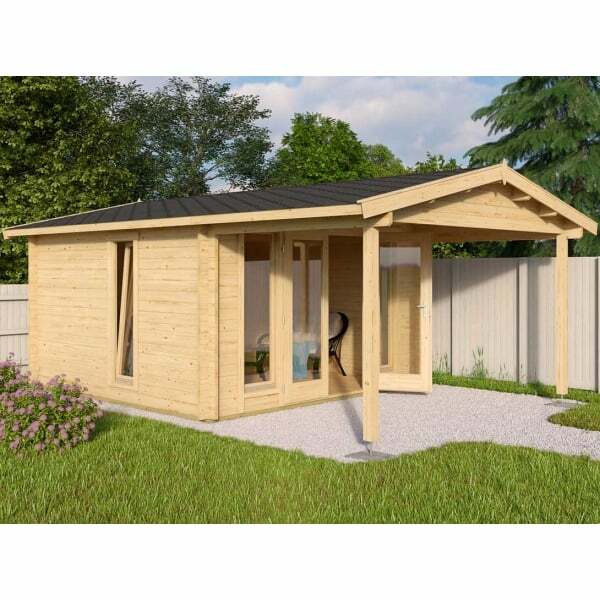 The Norland Bridgeford Log Cabin is easy to assemble and are an extremely sturdy structure as they are built in the traditional Log Cabin style and therefore uses no screws or nails in the wall construction. The Norland range also feature chalet corner jointing to give that extra timber jointing for extremely good weather resistance.